What I am beginning to understand is that when you see something, no matter how awful, over and over again, the lack of singularity rubs the edges off your shock and, before long, maybe even your disapproval. Awful becomes bad and then not-that-bad, and then something you may not like, but you don’t believe you can change. How far is it, then, from something you do not believe you can change to something you don’t even try to change -- a fact of life you accept? One day, I see a man, sitting in his wheelchair by himself. It is lunchtime. He is slumped down in the chair, his head lolling to one side, his arm hanging down. He is in a space between two units, six paces from the nursing desk. There is a tray of half eaten food in front of him, across the arms of the chair. Food is smeared all over his face, something yellow (I guess butternut squash puree from the faint smell), and some of it has dripped onto the front of his shirt, and on a napkin which has slipped away from his neck. He looks drugged or half asleep. I look around for someone, but the whole unit appears to be gone, as though it has been evacuated. I imagined the rest of the residents are at lunch, and some of the staff is probably with them. But who is with this guy and where is she now? I wait a little longer, and look around a few corners. Maybe someone has gone to get a spoon or a napkin? (Now is the moment I regret not being able to be hands-on, because I would ask him if he wanted me to wipe his chin. Now is also the time I am grateful I am not hands-on, because even the thought of doing it is making me queasy. ) I approach. He does not stir, at first. Then he lifts his head a little and lets it drop. Was that a yes? Did that mean no? “Did they forget about you? Let me get someone. Wait right there,” I say, as if he can do anything else. I am fuming. I want a huge bell to ring, to break the silence, wake everyone up. I march through the unit, looking for someone, until I come upon a closed door. I knock. “We’re having a meeting,” someone calls out. “It’s the ombudsman,” I say. The door springs open. “Thank you. Someone will be out in a minute,” someone says. Someone comes, but not in a minute, and as I wait, I wonder what I would do if he were my relative. My mother, so fastidious all her life, had a bib tied around her neck at the end. A friend of mine, in her nineties, says, “Don’t be embarrassed to tell me if my shirt is stained; my old eyes can’t see it.” If he were me. After someone comes, still stewing, I look around for Lisa, but since she is not there, I write down the time and place, and leave. I will tell her, and I will go back to this unit at the same time on another day, to see if it happens again. But by the fourth time I see the same man in the same mid-lunch position, the edge has definitely worn off. I look around for help for him, but my boiling anger is down to a simmer. I have spoken to Lisa about it, who tells me she has discussed it with the new administrator, and they have agreed it is a “staffing issue,” and they are “working on it.” I am distracted thinking about how they are going to solve their staffing issue, and it has somehow taken the focus off the resident himself. (Is it about lunch hours? Mandated breaks? Change of shifts?) And the resident: why is he there in the first place, instead of in one of the small dining rooms where aides feed residents who need help? Is there a better way to solve whatever problem he might have? Is this the way he wants it, for some reason? Frequently, noticing one problem brings up a host of other problems. It is like peeling an onion, as one of the trainers used to tell us. But by the time I think of all these questions, the man is not there anymore, and I assume (but I do not know if) it is because they have solved the staffing problem, or the problem he was having (which I did not even know about), or he has died or gone home. With 290 residents to look in on, I keep meaning to ask, but I never do. I don’t have time to peel the onion down to its heart. I am lucky just to pierce the skin of it, and then I am on to other residents and new crises. 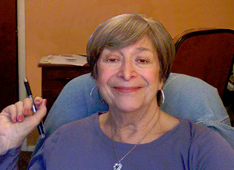 Bette Ann Moskowitz is an award-winning author and teacher. Her memoir Do I Know You? A Family’s Journey through Aging and Alzheimer’s won a New York State Foundation for the Arts (NYFA) Fellowship for Literary Non-fiction and The Room at the End of the Hall: An Ombudsman’s Notebook was a Finalist in NYFA’s literary non-fiction category. She has just finished the novel Three Legs in the Evening, a story about a middle-aged woman who reinvents herself, embraces a newfound sensuality and finds love again after a terrorist attack rocks her personal and external world. Bette has also been a dedicated teacher for decades and is a winner of the President’s Award for Excellence in Teaching.